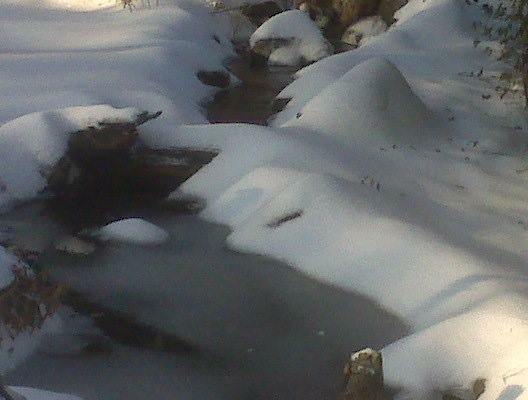 It’s getting cold and we are starting to see ICE on our ponds and round our waterfalls. Looking at the extended forecast its going to get worse! Next week the HIGHS are all below freezing! So, let’s be ready! Here’s a little info that will help! This is my stream after a 6″ snow. BEAUTIFUL!! Just plain ice will form when it gets VERY cold! AND, if your prepared, NOT a problem 🙂 Get a floating heater, and have a dry hose handy! The Winter Solstice marks the shortest day of the year. Good News is – the day after, the days start getting LONGER again! I always enjoy watching the days grow longer toward the Summer solstice & I have leaned to enjoy watching them grow shorter as we approach the Winter solstice. 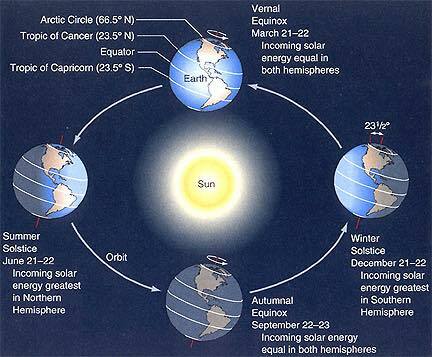 The winter solstice is the shortest day of the year and happens 5 days from today – December 21st. The best news is, the day after the solstice, the days start getting Longer again! Hee Haw! 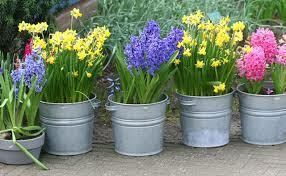 When do I plant Spring flowering bulbs??? We knew it was coming! It happens every year…. That first BIG pre-Winter freeze comes in, and I’m not prepared! I haven’t even put my leaf net over the pond and it’s getting down in the 20’s tomorrow night… EVERY night in the 10 day forecast as a matter of fact Soooo, I’m sending a little reminder to all my fellow Pondaholics. Have a dry hose available “just in case”! And an adapter for your sink faucet if you really want to be prepared for a BAD cold spell! Have a 5 gallon bucket set aside just for your pond. That bucket can really come in handy if you just need a little water or need a trash pail to clean up some leaves damming up the stream or waterfall! 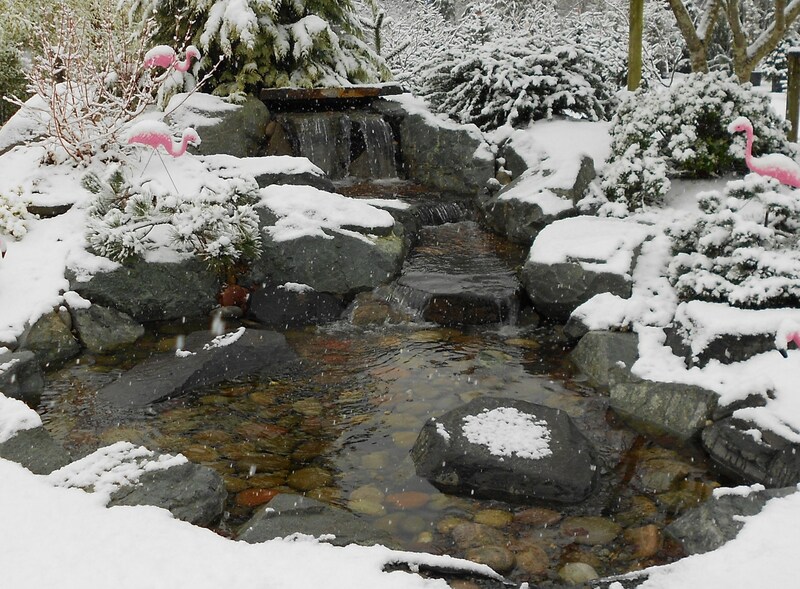 I could stay outside all day taking pictures of snowy, wintry ponds and waterfalls! WINTER BEAUTY: Leaving your waterfall running all season in our part of the country is not a bad thing. As matter of fact, it will give you some beautiful photo ops. During the fall & winter birds love to come to your pond to drink fresh water, and in winter months, the running water will make some breath taking natural ice formations/sculptures. So keep your camera handy. And get some close ups. BUT – be sure to watch out for ice dams! 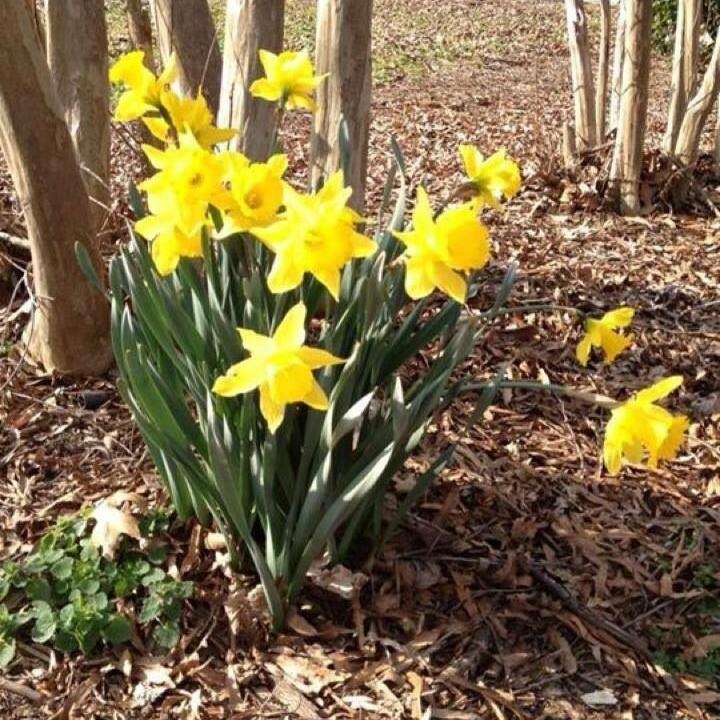 These can cause your pond to lose some excessive amounts of water. If this happens add water back in to your pond with that dry hose we talked about earlier to bring your water levels back up. Come by Carters Nursery Pond & Patio and get your cold temp. 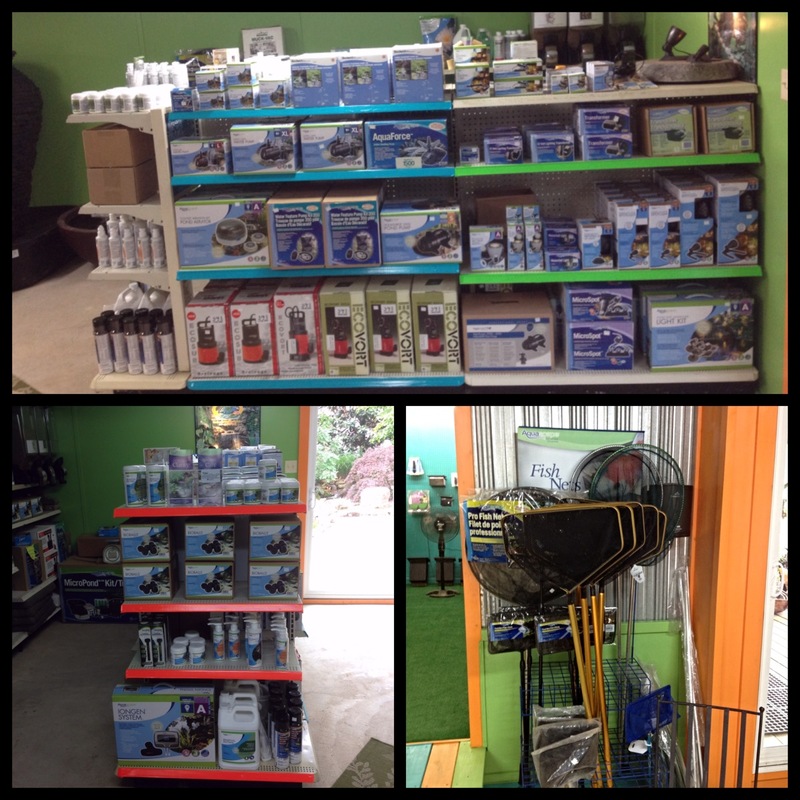 pond products, like – cool temp. bacteria, cool temp. fish food, pond thermometers, floating pond heaters, seasonal decoys, dipping nets and more! LOW TEMP. WATER TREATMENTS & LOW TEMP BACTERIA treatments should be used until the water temp. reaches 32 degrees. This will keep the bacteria active in your pond and promote healthier water for your fish during a longer period of time. In Spring, as water temps return to 40 degrees you may start the bacteria again. However this will not mean you no-longer need to clean your pond in the Spring because you will still have fish waste and plant debris in your pond that needs to be removed. I really hope this helps you to get ready! I have learned to enjoy every season with my Water Features and my best advice to you is : Be Ready! Happy Pondering & Merry Christmas!